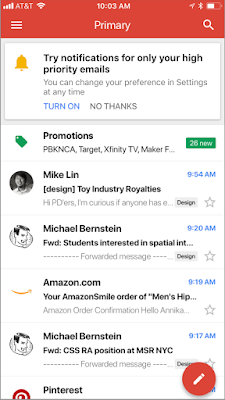 Google has today updated the Gmail app for iOS with a new “High priority only” notifications feature, that allows you to receive notifications only when important emails arrive in your Gmail inbox. Google says the feature leverages Gmail’s machine learning and artificial intelligence capabilities “to identify messages you may want to read first”. In order to enable the new feature on your iOS device, all you need to do is select “High priority only” from the Notifications drop-down in the settings menu of your Gmail iOS app. The new feature is now live for Gmail iOS app, and will be made available to Android users in the near future.